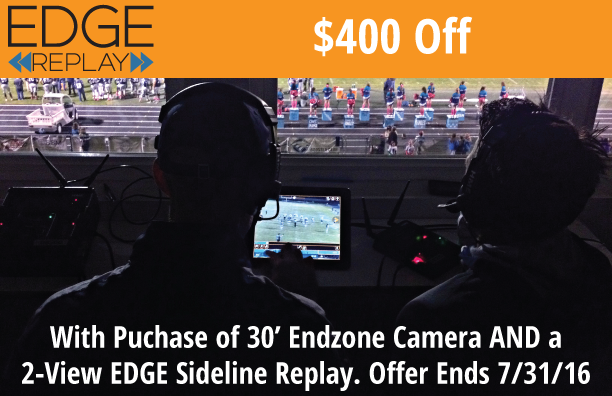 Through the month of July, receive $400 off your 2-view EDGE Replay System with the additional purchase of a 30' Sport Scope endzone camera system. Our 30' automatic endzone camera is a perfect match for your EDGE Sideline Replay System. The 30' end zone camera is designed for athletic programs of all sizes to get high-quality arial video of the field. This system can be setup in just a couple minutes and is simple to transport between home and away games. Plus, this endzone camera, unlike other systems, comes standard with everything you need to film, including an HD Sony camera, 9" HD monitor, 10-year frame warranty, rain gear, a travel case, and all of the cables needs to film. Our EDGE Replay Systems pairs perfectly with our 30' endzone camera. Just connect your endzone camera system to the EDGE Recorder Box using an HDMI cable and start filming. The video you capture on your endzone camera will instantly be ready to review on your iPad using the EDGE Replay App. It's that easy to setup and use. To learn more about our systems or hear more about this limited time savings, please call 888-335-7875. Offer good until 7/31/16.